View of downtown Boston from the Boston Public Garden. This spring Catherine and I went to Boston. It was the last major city in the United States that I had not been to. I had heard good things about JetBlue, but I hadn't had an opportunity to fly with them. 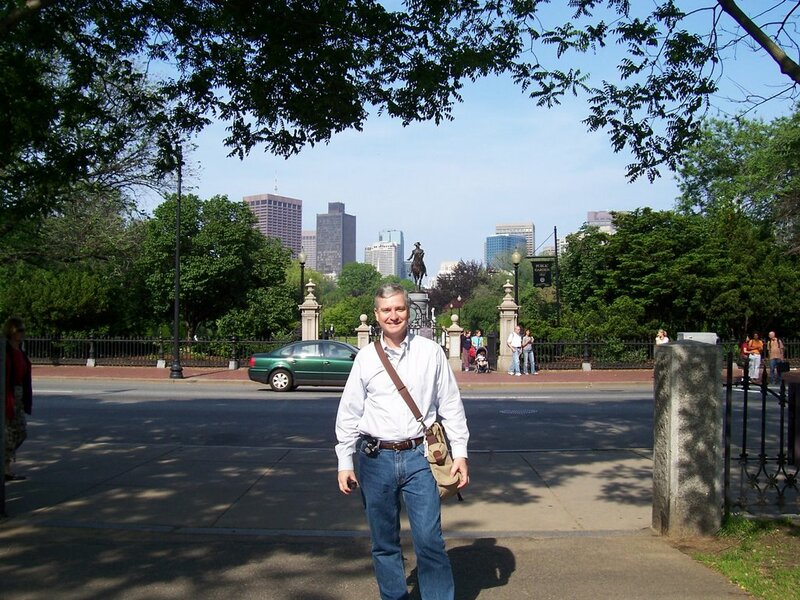 I wanted to try them out, so we caught a flight on Jet Blue from Oakland International airport to Boston Logan airport. We received very pleasant service from the crew and I found the plane to be unusually clean. It was also nice having the live television in the back of the seats to watch as we flew across the country. Catherine near the residence inn that we stayed in during the first half of our trip. We stayed at a residential inn for the first half of our trip. A residential inn is sort of like a bed and breakfast without the breakfast. The outside looked great and the lobby was interesting with a lot of character, but when we went into the room there was a large window without a curtain that you looked out from the bedroom and bathroom into other apartments across an alley. There was absolutely no privacy. That evening Catherine and I went to a Trader Joe's grocery store and bought some paper towels and tape. Then when we went back to the hotel that night, we taped the paper towels over the window. The other problem was not so easily fixed; the mattress felt like it had a hole in the middle because it was so worn out. All night I kept feeling like I was falling into this hole. 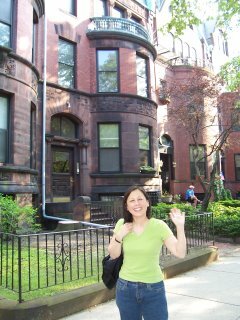 Well, hotels are expensive in Boston and this was an inexpensive place, but I was very happy when we eventually left and went to other accommodations later during our trip. 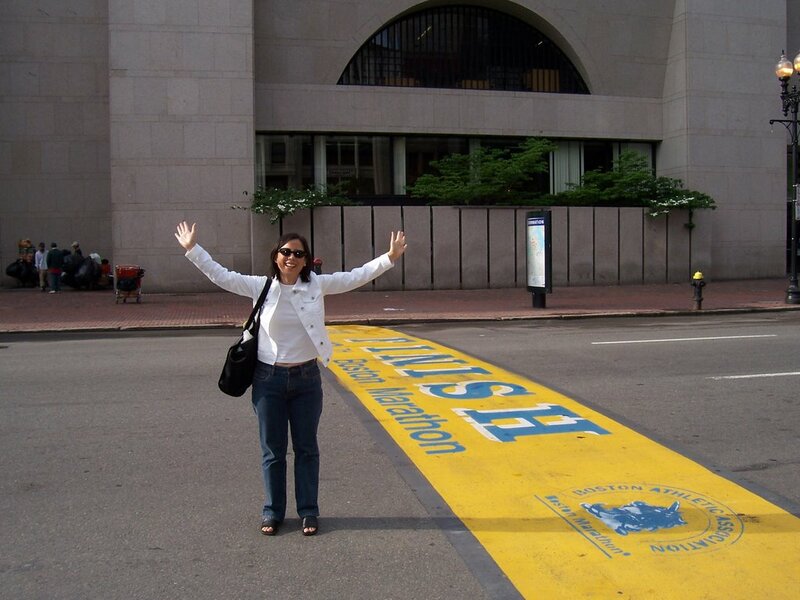 Catherine pretending to finish the Boston Marathon in first place. Good job Catherine! 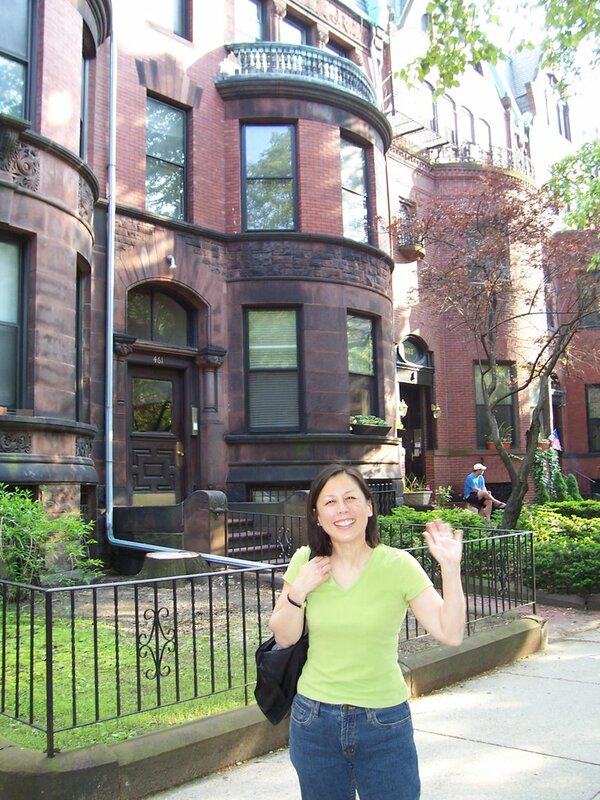 Our hotel was in the Back Bay area, so it was an easy 15 - 20 minute walk to downtown. We didn't rent a car during the first part of our trip because Boston has such a good subway system for the main Boston area. 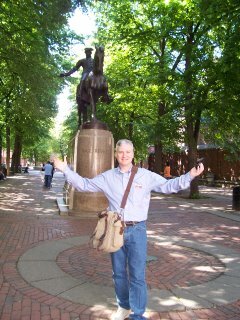 A statue of Paul Revere at the Paul Revere Mall. We walked the entire obligatory Boston Freedom Trail. This is a walk throughout Boston of sixteen historic sites from the American Revolutionary War, connected by a 2.5 mile red brick line. 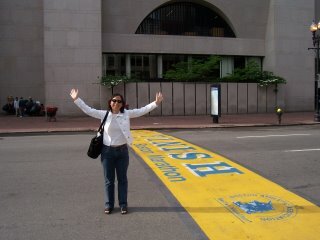 You just walk and follow the line and it will lead you to the major sites in Boston. I found this to be particularly relaxing because you didn't need to be constantly looking at a map. Instead you could enjoy just looking at the city around you. Catherine at the Boston Public Garden. 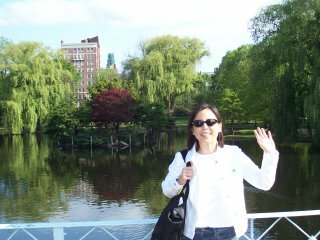 The Boston Public Garden is a twenty-four acre park in the middle of Boston. It was beautiful with nice ponds and tree covered walkways. It was especially nice to sit on a bench in the shade during the heat of the day and watch the ducks play in the water. 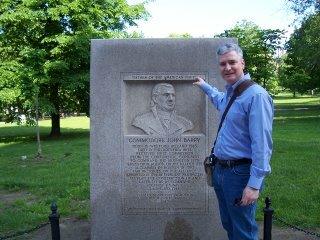 Along the Freedom trail there are numerous major sights and also small markers like this one to Commodore John Barry, the Father of the American Navy. Catherine in front of the Old State House where the Boston Massacre occurred. 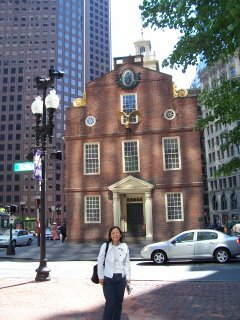 One of the major stops is the Old State House, the seat of the Colonial and State governments. Behind the building is the spot where the Boston Massacre occurred. I have often read about the American Revolution and it was especially interesting to visit Boston to help bring that history alive. Penguins at the New England Aquarium in Boston. 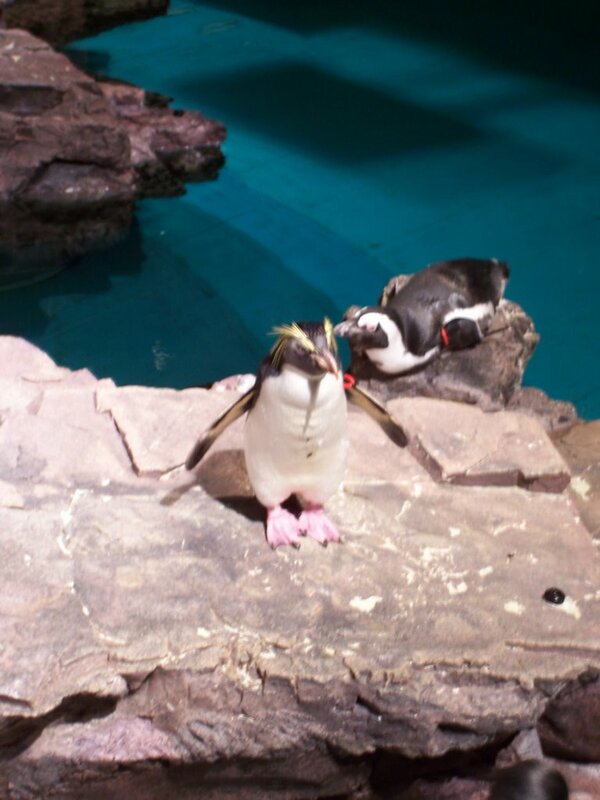 One of the places we enjoyed the most during our stay was the New England Aquarium. They have a colony of over sixty penguins. We especially enjoyed the penguins because before our trip we watched the movie March of the Penguins that we enjoyed. Catherine in front of Paul Revere's house. 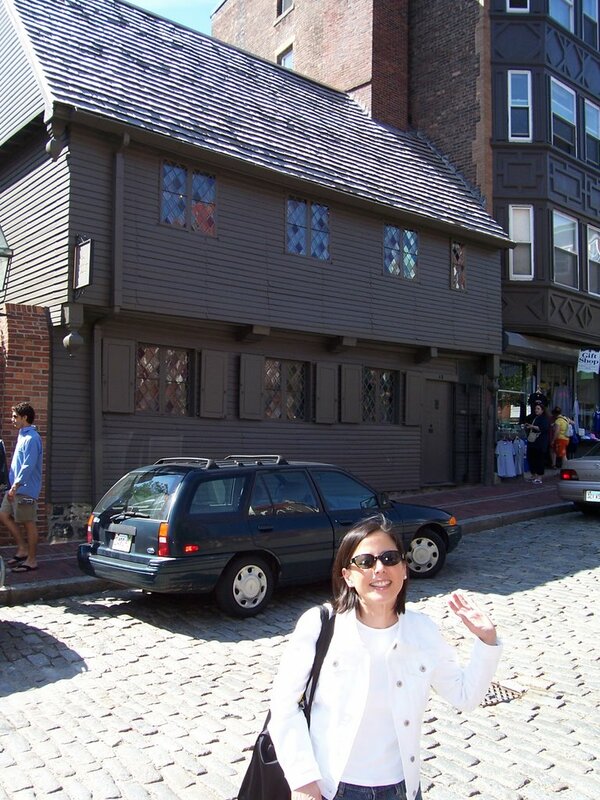 Another nice stop on the Freedom Trail is Paul Revere's house. We took a tour of the inside and it is much like it was when Paul Revere lived there. I recommend the book Paul Revere’s Ride by David Hackett if you are interested in learning more about Paul Revere. This is one of the books I read before my trip to understand more about the history surrounding the Boston area.